There are few mediums left for Alan Partridge to conquer with his unique brand of humour, having dabbled in sports via The Day Today, television with Knowing Me Knowing Me and the hysterical I’m Alan Partridge, literature in the form of an autobiography and more recently Norfolk’s airwaves through Mid Morning Matters. Despite the fictional quote machine’s success on all platforms there is one vehicle left to house his talents- the silver screen. Touted for years and craved by Partridge fans more than a blazer badge and tie combination pack, a cinematic full feature was announced last year to cries of Partridgeisms: “cash back!” and “back of the net!” The Steve Coogan constructed character is undoubtedly his most popular yet despite the success there was notable amount of apprehension about whether the usual 30 minute doses of the former BBC employee would translate effectively to a 90 minute cinematic. While yes, the film is an extender of his television outings, it manages to be marginally more than just an overly long episode of I’m Alan Partridge through an entertaining, suitably stupid, hostage situation centred plot. Alan’s employer, North Norfolk Digital, is taken over by multinational corporation leading to a rebranding as Shape, a trendier and younger image that puts the stalwart DJs at risk. The change in management sees veteran DJ Pat Farrell (Colm Meaney) sacked from the station, saving Alan’s job in the process. Not taking it too well Pat goes postal, taking the station’s occupants hostage with his former colleague, Alan, the only man he’s willing to negotiate with. What follows is undoubtedly vintage Partridge- both a homage and accumulation of his funniest moments since the character’s introduction some 20 plus years ago. Coogan, who is more Partridge than he would care to admit, is brilliant as ever as the rude and awkward comic genius. Giving his fans the biggest helping of Partridge means there is little deviation from the norm with familiar scenes of charismatic miming to his driving tunes, surreal day dreaming sequences along with hysterical radio conversations like “who is the worst monger? Fish, iron, rumour of war?” Radio One’s Nick Grimshaw could learn a thing or two from Alan. Much of Alan’s success and funniest lines are down to his opposite, boarder-line mentalist Pat Farrell. Coogan steals the show but Meaney does a fantastic job of a man on the edge, managing to deliver a host of laughs as well as a foil to Alan’s stupidity allowing the jokes to bounce between the two. The return of Alan’s timid assistant Lynn (Felicity Montagu), confused Geordie Michael (Simon Greenall) and rival disc jockey Dave Clifton (Phil Cornwell), who is recovering from a breakdown, are a welcome sight, furthering fulfilling fan’s Toblerone sized longings for Partridge nostalgia. These familiar faces are always on the film’s periphery, playing second fiddle to Alan and never quite getting enough screen time, especially in regards to Michael whose comic contribution to I’m Alan Partridge was one of its highlights. The humour is typical Alan Partridge which is brilliant for his fans but less so for his detractors who are unlikely to find anything redeeming or different to change their opinions on TV Quick’s ‘Man of The Moment’ 1994. 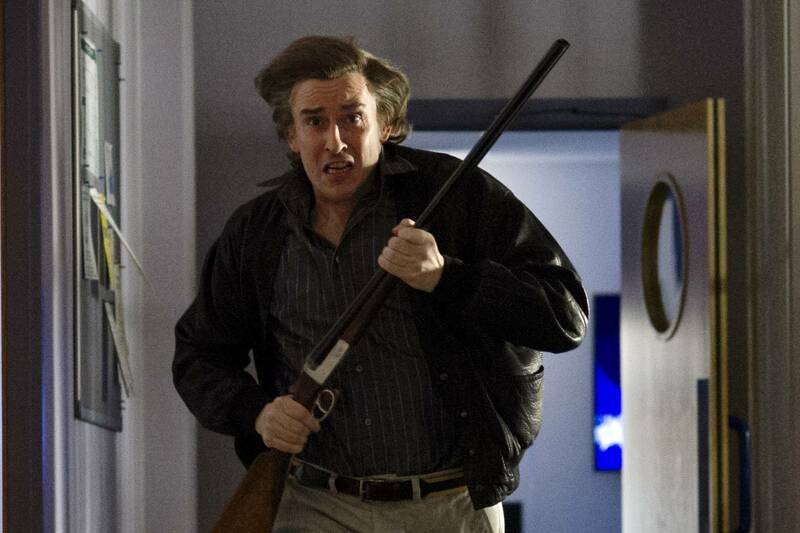 As funny as anything Steve Coogan has produced under the guise of Partridge the real bonus for fans is the inclusion of a sprinkling of action, it’s not Die Hard but there are guns, car chases and Tasers thrown into the mix for some added excitement. The tongue and cheek action elements are interwoven to the film with a delicate amount of subtly as not to be overtly ridiculous or deter from Coogan’s performance but supplement it, much like the bonus of having Bangkok Lady Boys available to watch in your Linton Travel Tavern room. There’s not much to say about Alpha Papa simply due to the fact that Alan Partridge literally will do all the talking, the film’s best moments usually stemming from his lips. The cult figure has always been one of British comedies most quotable and Alpha Papa will provide a whole new abundance of lines to be repeated endlessly after the final credits. Partridge fans will revel in the film as it ticks all the appropriate boxes, those who aren’t ardent aficionadas will still find plenty of entertainment in film’s ridiculous plot and be in no danger of being bored enough to dismantle their Corby trouser press. Rude, arrogant, the antithesis of political correction but Alan Partridge remains a gem of British comedy that we just can’t help but love, as he tells his assistant “enjoy me Lynn, everyone else is”. Sound advice indeed.